Monday 26 Had my men to sign the pay rolls for the months of July & August. Began to make out our muster and pay rolls for the months of Sep & Oct. This is going to be quite a task again, I am not situated to make them out, my tent is not arranged well enough, nor sufficiently supplied with furniture to make me feel at home, yet at it I go and finish I must. I managed to get a table made today, also several seats. I think I forget to mention that Major Keeler was released from arrest on the 13th inst. Tuesday 27 Worked in a good earnest at my muster and pay rolls. 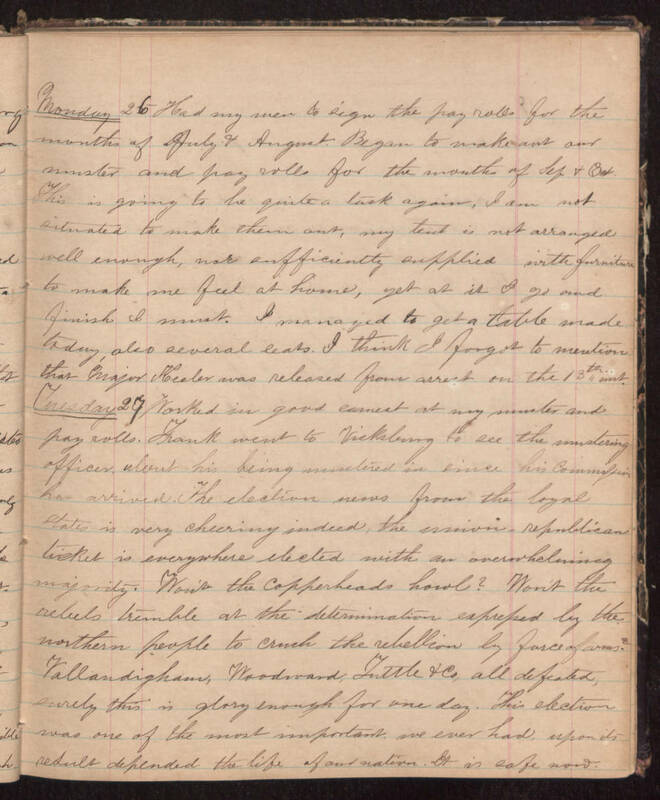 Frank went to Vicksburg to see the mustering officer about his being mustered in since his commission has arrived. The election news from the loyal states is very cheering indeed, the union - republican ticket is everywhere elected with an overwhelming majority. Won’t the copperheads howl? Won’t the rebels tremble at the determination expressed by the northern people to crush the rebellion by force of arms? Vallandigham, Woodward, Tuttle &Co, all defeated, surely this is glory enough for one day. This election was one of the most important we ever had, upon its result depended the life of our nation. It is safe now.